Looking for a new way to prepare an omelette? 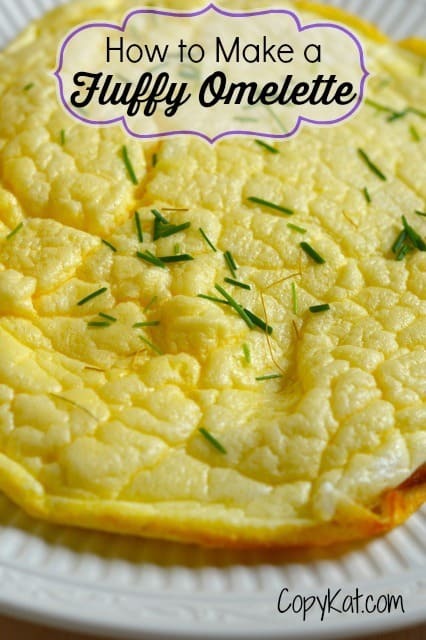 This fluffy omelette is a great way to make a few simple eggs look very large. Eggs are separated when you crack them open, the whites are beaten separately, and then the egg yolks are folded in. This recipe is part of my learn to cook series. My learn to cook series features simple recipes straight out of my junior high school cookbook. So you know if I was being taught how to cook like this in junior high this recipe is bound to be easy. This omelette is different than most you have eaten. Egg whites are beaten until they have stiff peaks. This gives this fluffy omelette its height. You need to gently incorporate the beaten egg whites and the yolks together gently, you do not want to stir out the air you have carefully whipped into them. You will then cook this on the stovetop for just about 1 minute and then you will place this fluffy omelette into the oven so it can finish its cooking. There are a few different ways you may want to top this omelette. You may want to add some salsa, or fresh herbs, or even sprinkle some cheese on top. You could also saute 2 tablespoons of chopped onions in 1 tablespoon of butter to top this omelette. Beating the egg whites adds lots of volumes and makes your omelet extra light. Preheat oven to 350 degrees. Separate yolks and whites of eggs. Beat the yolks until they are thick and light colored add flour to the egg yolks. Mix in the flour well into the egg yolks. Add salt and water to the egg whites. Beat egg whites until they have stiff peaks and are dry. Gently fold the beaten egg yolks into the egg whites.Add two tablespoons of butter to an 8 inch oven-proof skillet over medium heat. Spread egg mixture in the skillet and allow to cook for 1 minute before placing the skillet in the oven. Leave in the oven for 10 to 12 minutes or until omelette has set. Serve immediately. You’ll never find fresh eggs at the supermarket, at best they’ll be a week old. For truly fresh eggs you either have to seek out someone who has laying hens, or obtain some of your own. Once you’ve tried freshly laid eggs you’ll never go back to store bought ones. I am lucky, I get my eggs from my Mom’s flock of chickens. These eggs are very fresh. I also know what they get fed. What a great idea, separating the whites! I’ve never tried that! You should give it a try sometime. It does wonders on making what you serve seem like a lot. Thank you. When are the vegetables or cheese added? Also, what if I don’t have an oven proof pan (unless you mean a cake pan). Also, off the subject, what is pancetta? I’ve seen it in a recipe for chicken Marsala. Is it necessary? You can add veggies and cheese after, this way it stays nice and fluffy. A skillet should work ok. When you put this one the stove top it will set up there, so transfering may not work well. Panacetta is a type of bacon. You could use bacon, it definitely is worth adding to that recipe. I hope this helps.